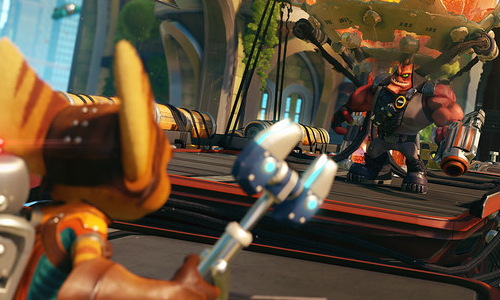 Ratchet & Clank has finally been announced for pre-order today. The PS4 game will tell a whole new version of the origin story to refresh the many players who've played the original game. It will come with new planets to explore, new boss fights, and new flight sequences along with modern Ratchet & Clank Controls. Ratchet & Clank now has confirmed release days, coming as early as April 15th in France, April 22nd in the U.K., and April 20th in all other regions. Prepare to embark on a journey with Ratchet, the Lombax with a dream to become a Galactic Ranger, and Clank, his fellow sidekick and friend. They will have to fight an unstoppable evil from destroying the galaxy. Some notable returning characters are Ratchet, Clank, Qwark, Big Al, Dr. Nefarious, the evil Chairman Drek, along with many new characters. If you've missed roaming around the Solana Galaxy, you'll have a chance to explore it once more. The size of the game has already been revealed, thanks to a few European stores listing it on their websites. The game will be 26.4GB, unlike the previous titles weighing around 40GB. This will encourage some players to buy the game since it's a really decent size. Also announced is the Ratchet & Clank movie, which will be in theaters April 29th, 2016 in the U.S. Are you excited to play the game, or watch the movie? If so, share your thoughts in the comments down below. chadillac1337, rghZane, Crooks and 1 other person like this.